Despite its name, buckwheat doesn’t contain any wheat (or gluten). It is a favourite among those on a gluten-free diet as it is a good source of vitamins, minerals, amino acids and antioxidants. It can help to relieve constipation, aid digestion, reduce hypertension and lower cholesterol. Read more about buckwheat here. 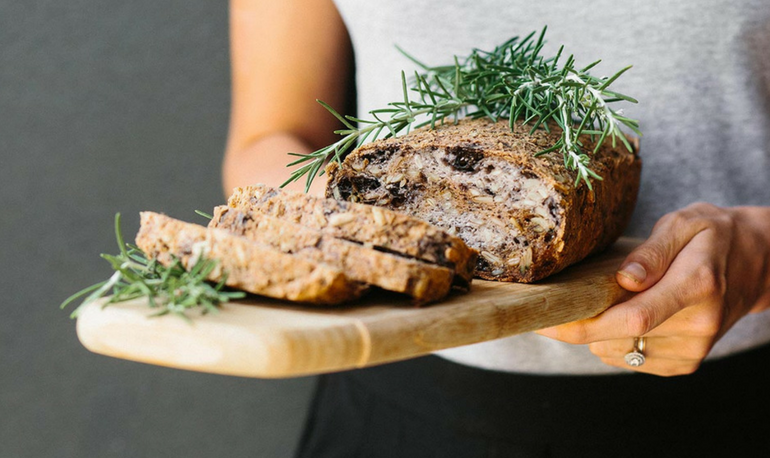 This recipe, using buckwheat, makes a nutritious, tasty loaf. We love the addition of olives and cheese, but you can try adding in other ingredients to vary it each time. Combine the almond or hazelnut flour, rosemary, salt, buckwheat flour, psyllium, chia, sunflower seeds, bicarb and salt in a large mixing bowl. Mix together using a fork to make sure there are no lumps. Combine the water and the apple cider vinegar in a cup. Pour the water mix into the dry mix and combine thoroughly. Please note that it is supposed to look like a thick, sloppy, grey-ish mess (but don’t worry as it turns a nice dark brown when you bake it). Cover this mix with a tea towel and allow to sit in the bowl for an hour. Now preheat the oven to 180˚C and also line a loaf tin with baking paper. After an hour check on the bread mix. It should have absorbed any excess water, though it will still be wetter than a standard bread dough. It will feel quite sticky to the touch. Now mix the olives and cheese (if adding) and an extra sprinkle of herbs if desired. Scoop the dough into your loaf tin and smooth the top out as evenly as you can. Place in the oven and cook for 65-70 minutes. At the 1 hour mark, check on the bread and make sure it is not burning. It should be a very dark brown on the outside, and very firm to touch in the centre when it is done. Remove the bread from the oven and leave in the tin for 5-10 minutes to cool slightly. Then remove it from the baking tin and place it on a wire rack to avoid it “sweating” in the tin. Once it has cooled completely, slice and store in the fridge for up to a week or keep in the freezer. Serve toasted with butter and/or avocado on top. Adapted from Nourish Everyday’s Vegan Buckwheat Bread. Hi Ange. Thanks for getting in touch. We don’t see why you couldn’t use sunflower seed meal instead, although we haven’t tried it with that. Let us know how you go! Have made this twice, first with rosemary and olives second without so we could have it with honey. Toasts beautifully and slices well.